WWALS Ambassador Dave Hetzel explains the Alapaha River Water Trail: recreation through fishing, swimming, boating, conservation, and economic benefits through heads on beds, restaurant customers, gas, and outfitters. The Alapaha River Water Trail could even help attract knowledge-based companies as they see this improved quality of life for local citizens. 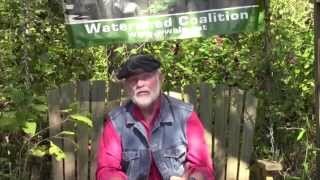 Video by Gretchen Quarterman for WWALS Watershed Coalition (WWALS). See also these presentation slides. You can help WWALS build the Alapaha River Water Trail, by becoming a member today! This entry was posted in Blueway, PR and tagged Alapaha River Water Trail, Blueway, conservation, Dave Hetzel, Economy, Georgia, John S. Quarterman, Lowndes County, north Florida, PR, river, south Georgia, watershed, WWALS, WWALS Watershed Coalition on October 30, 2014 by jsq.